Are Powerful CEOs Right for Nonprofit Organizations? The research literature clearly shows that having a powerful CEO creates the potential for him or her to abuse this position to extract personal benefits or engage in excessive risks activities. At the same time, the research also shows that (CE0) power is often critical to the successful completion of tasks and the achievement of corporate objectives (and missions). To this end, powerful CEOs can ultimately be a success or a failure. Are shareholders (stakeholders of nonprofits) better or worse off with a powerful CEO? While it is the role of the board of directors to oversee management, at some point the board must empower management to make decisions. Where should it “draw the line” between giving its CEO discretion and providing appropriate oversight? How much power is too much power? The board of directors establishes and monitors corporate policy. The board operates through the chief executive whether it be an ED or a president/CEO. The CEO, in turn, executes policy and is responsible for the prudent and creative operations of the organization. In this role, the CEO exercises leadership resulting in the effective and efficient use of board and non-board members’ time. •	Establishes long-term organizational objective and outcomes. •	Sets overall policy affection strategies designed to achieve objectives and outcomes. •	Provides formal recognition and acceptance of executive decisions when related to operational decisions. This attempts to “draw the line” by listing all the board responsibilities necessary to develop an effective and efficient nonprofit organization. All other issues not reserved for the board fall under the responsibilities of the CEO. 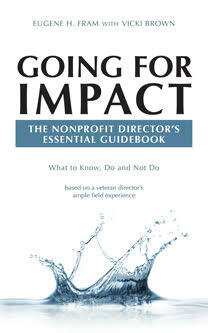 Thousands of nonprofits have successfully adapted or adopted it. It provides for significant operational powers for the CEO that must be counterbalanced by fair and rigorous assessment of the CEO and operational outcomes conducted annually. The way the line between board and CEO is drawn also allows for more than usual nonprofit organizational professionalism, flexibility and building a trusting environment, with mutual respect for all involved. In summary, it allows a nonprofit to eliminate the “parent-child” relationship between board and management found in many nonprofits. The line allows a new working environment with some different challenges related to maintaining board involvement and organizational formality. Personal gratification is more immediate for board members when they are working with operational rather than policy/strategic questions. Board members require ongoing attention from the chair and CEO to heighten their motivation. For staffs, the relationships will become more formal. But this is a natural outcome for any growing organization. In summary, there has to be a substantial level of trust between the board and CEO to delegate the level of operational powers described above. *Is a Powerful CEO Good or Bad for Shareholders? (2012), Stanford Closer Look Series, November 13th. I find the term powerful CEO an interesting one. The need for intelligent, creative people who can get things done, in the role of CEO is vital to a none profit. This has to be managed by the board using the right level of controls and checks, this is about being very clear about the CEO role, the parameters of their responsibilities and the levels of decision making that they are empowered to make.This; delegation of responsibility has to be clearly made and recorded, the CEO has to be given the support, resources to carry out their job and it has to be clear when a CEO needs to get permission from the board to do something that is outside of this framework. It is the balance between giving the CEO the freedom to “get on with it” and the board having the appropriate control that good governance demands. If an organisation does not have such a framework it is in danger of allowing a strong willed person or “powerful CEO” the freedom to take the organisation in a direction the Board may well be unhappy with. If a board is not clear about what it wants, it is very easy for a CEO to bring their own vision to the organisation (this may well be seen as wrong by the board), leading to the “we did not say he/she could do that” situation, that was in fact caused by them, not saying he/she could not. Eugene; You are quite right this is the other side of the same coin, the board has to be well served by their CEO or they will not have all the information they need to make the right decisions and delegate responsibility accordingly.. Some boards do become isolated from their own organisation (sometimes because they do not ask for the right information) and some because their CEO does not know the answers or they have not found a way to articulate, the big picture to the board..
Mark; Again, we are reading from the same page.